Street Pastors are Christian men and women who engage with people on the streets offering reassurance, safety and support through listening, helping and caring. We work together with other partners in the night-time economy, schools and communities to make our city safer. 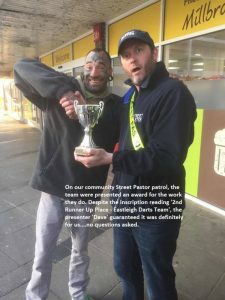 Each city project is set up by Ascension Trust, which is the governing body behind Street Pastors, and run locally with support from local churches and community groups, in partnership with the police, local council, schools and other statutory agencies. Southampton Street Pastors is a charitable company (Comp. No. 7292166 & Charity No. 1137759) that has over a 100 Christian volunteers drawn from over 50 churches in and around Southampton. In Southampton we have been operating since 2009. A Street Pastors life is varied and the good people of Southampton like to show their gratitude…. Proof that angels do indeed walk before (and behind) the Street Pastors!